Full of festivals and outdoor activities galore, the summer months are a great time to visit. Once dinner's cleared, spread out that 1,500-piece puzzle you brought, and see if you've got any takers. No wimpy breakfasts. A big day on the slopes calls for way more than a yogurt or bowl of cereal. Stylish lodge decor and glorious outdoor views make the lobby a great hangout spot. 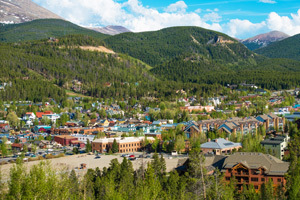 Lively downtown Breckenridge is only a 3-minute drive away. The classic Main Street is a must. With a patio surrounded by forest and a beautiful ballroom, Mountain Thunder Lodge is perfect for your destination wedding. Brave the chill in the air and go for a swim in the heated outdoor pool. Try all five outdoor hot tubs, and declare a family favorite. Hike the 6-mile Spruce Creek Trail, an easy 13-minute drive from the resort. Book a tee time at Breckenridge Golf Club, just a 10-minute drive away. Ski-in/gondola-out access via the Skyway Skiway makes Mountain Thunder Lodge a favorite among those adamantly opposed to hauling awkward armloads of ski gear out to a shuttle stop or remote parking lot. Log beams, slate floors and a massive rustic stone fireplace in the lobby bring the best parts of the outdoors in. Meanwhile, tiered antler chandeliers remind you to keep your eyes peeled for wildlife sightings – moose, elk, deer, bears – even porcupines (steer clear!). Five outdoor hot tubs dot the property, and the outdoor perfectly-heated pool setting is a wow – one of the most scenic in town. There are two fitness rooms onsite if you’re feeling ambitious. And your Mountain Thunder guest status is like having a VIP pass to the amenities at nearby One Ski Hill Place. Hit the two-lane private bowling alley, aquatic center and family-friendly movie lounges with the kids. Or sneak away (sans kids) for massage and skincare treatments at the Rejuvenation Center. The inviting, Western-themed residences at this award-winning stay (just two blocks off Main Street!) range from studios to three-bedroom luxury condominiums. With up to 1,400 square feet of living space, you’ll have enough beds for four to eight mountain adventurers to rest their weary heads, sore quads and tired everything else. Gourmet kitchens delight with granite countertops, stainless steel appliances and ample room for snack-stashing. And outdoor grills are your go-to when the weather’s not sub-ridiculous. The living area doubles as game-room-slash-movie theater – ask about DVD rentals when you check in. Balconies and patios are popular with the summer crowd, while the cozy moss rock fireplace gets a gold star from winter guests. You’re a short walk from the BreckConnect Gondola, or you can hop the complimentary curbside shuttle into vibrant downtown Breckenridge. A former base camp for gold miners back in the day, the historic district is alive and well, accompanied by newer boutiques, bars and restaurants. Summer and winter vie for most popular season, but both locals and out-of-towners have declared it a tie – hoping each season will continue to one-up the other with festivals, events and once-in-a-lifetime experiences like dog-sledding and hot air balloon rides.